Party leaders urged residents to take advantage of early voting this week as storm preparations continue for tropical weather systems headed toward the islands ahead of Saturday's primary election. Star-Advertiser. The chairwomen of the Hawaii Republican Party and the Democratic Party of Hawaii today issued a joint call for voters to cast their ballots early to ensure their safety as Hurricane Iselle and Tropical Storm Julio bear down on the state. Iselle could threaten the eastern coast of Hawaii Island as soon as Thursday and Julio may bring dangerous conditions on Saturday. West Hawaii Today. Abercrombie Implores Supporters to Get Out the Vote. Upbeat at his final campaign rally before Saturday's primary, Hawaii governor recalls that no one expected him to win 40 years ago, either. Civil Beat. Hawaii candidates who support GMO labeling , pesticide disclosure and restriction. Hawaii Reporter. Ethnicity as a common denominator in Hawai’i elections is not as pronounced as it once was in the 1950s and 60s. But as Hawaii Public Radio’s Wayne Yoshioka reports, ethnicity is still viewed as an important characteristic in local political races. Hurricane Iselle is weakening. The eye is not as apparent and the storm is not as symmetrical as it was 24 hours ago. KHON2. Hawaii island, Maui County and Oahu are under a tropical storm watch and the entire state is covered by a flash flood watch as two hurricanes east of Hilo Wednesday pack a potential one-two punch of heavy rain, high surf and powerful winds.Star-Advertiser. The Central Pacific Hurricane Center has issued a Tropical Storm Watch for Oahu as weakening Hurricane Iselle continues on its path towards the Hawaiian islands. Forecasters issued a Tropical Storm Watch for the Big Island of Hawaii earlier Tuesday and Maui County late Tuesday. Hawaii News Now. Hurricane Iselle continues to churn menacingly from the east, weakening as it encounters Central Pacific wind shear and cooler waters but still is expected to be capable of unleashing flash flooding, tropical storm-force winds and ocean surge starting Thursday afternoon in Hawaii. Star-Advertiser. 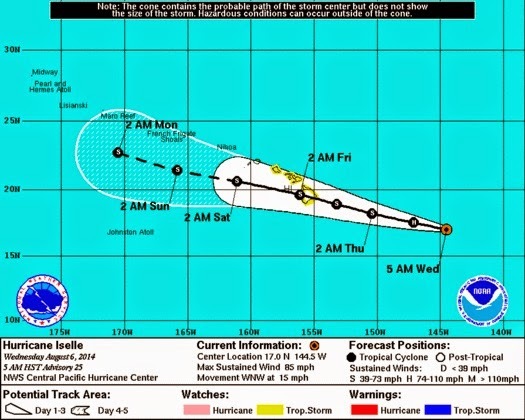 Hurricane Iselle continues to make its way toward the Hawaiian islands and is expected to weaken to a tropical storm by the time it hits the Big Island and Maui County on Thursday before it progresses across the archipelago Friday. Civil Beat. State officials are closing scores of recreation areas that could be affected by rising streams, flash flooding, falling trees or high surf touched off by the arrival of tropical storm Iselle. Star-Advertiser. Hawaii is used to preparing for tropical storms — stock up on water, toilet paper and other essentials and wait. But actually getting hit with systems like the two approaching the islands? Not as much. Associated Press. Hawaii Disaster Team Ready for Anything. With a hurricane and tropical storm approaching the islands, local emergency personnel are training for widespread casualties. Civil Beat. Hawaii hotels are preparing for Hurricane Iselle and Tropical Storm Julio, which are expected to bring heavy rain and strong winds to the Islands starting Thursday, by testing generators, stocking up on bottled water, first aid kits, flashlights and other supplies, as well as canceling reservation fees for guest and setting aside rooms for employees. Pacific Business News. Hawaiian Electric Co. may now move ahead with contract negotiations with six solar energy developers on Oahu whose projects total 210 megawatts after state regulators approved the state’s largest electric utility’s request to forgo the competitive bidding process for the projects. Pacific Business News. The Hawaii Department of Transportation is cracking down on two ride services that entered the Oahu market in June, ordering them to stop picking up and dropping off passengers at Honolulu International Airport. Civil Beat. Criminal proceedings against an aerial advertising company and the pilot it hired to fly banners over Oahu will be held later this month. Star-Advertiser. Students call for investigation into Apple’s termination. ASUH and GSO have sent a letter to Governor Abercrombie requesting a formal investigation into the firing of Tom Apple. Hawaii Independent. Lawyers for the state and murder defendant and federal agent Christopher Deedy told the jury in closing arguments of the U.S. State Department special agent's retrial Tuesday that they do agree on several points. Star-Advertiser. Upcoming leadership changes in the state Legislature could be good news for counties seeking to increase their share of hotel taxes, the Hawaii County Council learned Tuesday at a meeting with several state legislators. West Hawaii Today. Hawaii County’s battle against the little fire ant will get a little more bite with a unanimous vote Tuesday by the County Council Finance Committee to accept $375,000 from the state Department of Agriculture and the Hawaii Invasive Species Council. West Hawaii Today. Kamehameha Schools officials have taken another step toward demolishing the shuttered Keauhou Beach Hotel. West Hawaii Today. County emergency responders were busy preparing Tuesday as Hurricane Iselle and Tropical Storm Julio continued their march toward Hawaii. Tribune-Herald. Maui County Council candidate Ka'ala Buenconsejo has the backing of two super political action committees based in Honolulu that independently have spent more than $130,000 in mailers, radio ads and media consultation for the first-time political candidate seeking to unseat Elle Cochran for the West Maui residency seat. Maui News. Maui Continues Preparations for Iselle’s Stormy Weather. Maui Now. Visitor industry officials on Kauai say they are worried that recent property tax rate hikes approved by the Kauai County Council will deal a blow to one of the island’s main economic drivers: tourism. Garden Island.